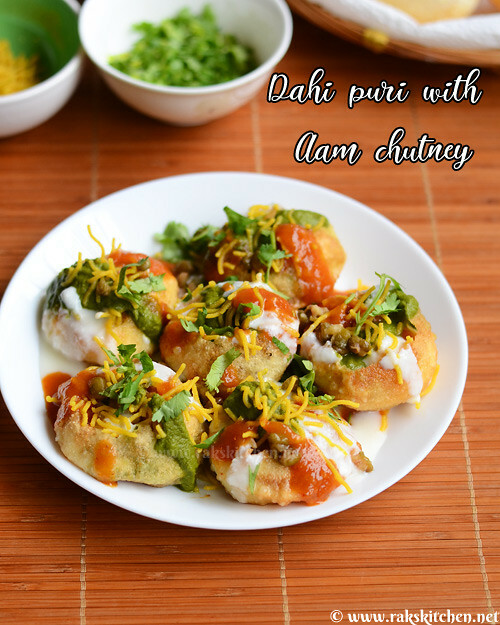 Aam dahi puri, recipe for sweet chutney prepared with ripe mango. 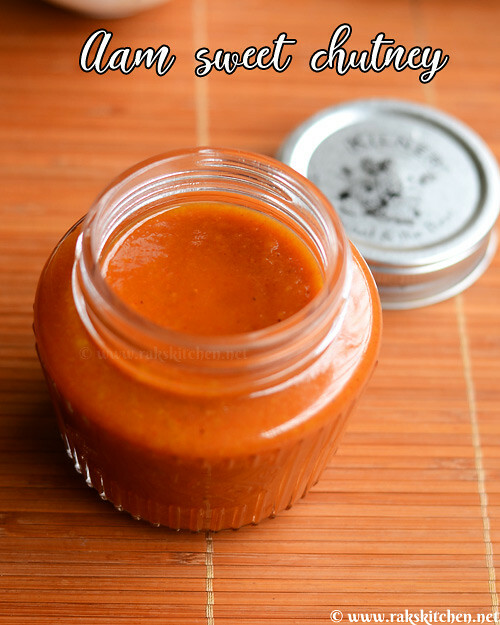 This chutney can be used for all chaats and even as a dip for samosas, papad.What I love about all chaat is the sweet chutney. I am sweet toothed and anything sweet in chaat is my kind of snack. May be that is the main reason I love Kailash parbat chaats. Their chaat are made with an extra dose of the sweet chutney. Especially love their bhel. 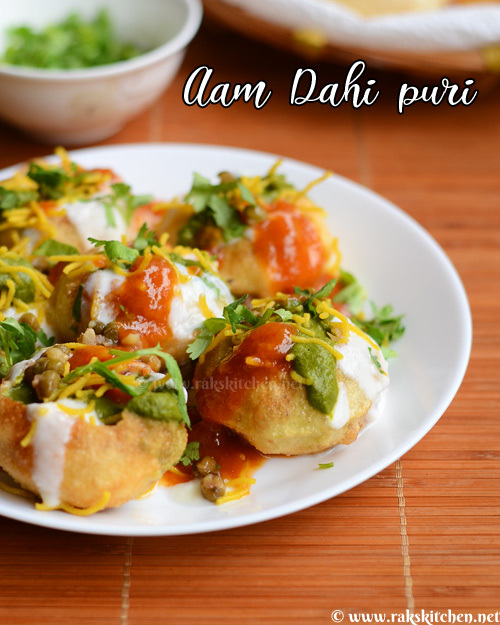 I have not been to any authentic chaat counters in India, so KP chaat is my favorite here in Singapore.When I was browsing Instagram, I saw this idea of using sweet mango sauce in chaats. So I wanted to try out for this mango season. The sauce I saw was pretty much like aam ras, but I made it just like we would make sweet chutney with dates and tamarind. I just fine tuned the recipe with ripe mango. I wish I had alphonso, but Banganapali mangoes too were perfect. May be I would have got a better yellow/ orange colour. To prepare Mango sweet chutneyScoop the pulp of mango. Grind it smoothly (total 1 cup)In a heavy bottomed saucepan, take mango pulp, black salt, amchoor powder, red chilli powder, roasted cumin seeds powder, dry ginger powder, powdered jaggery and mix 1 cup water. Heat over flame.Boil for 2-3 minutes or until the sauce turns shiny side. Adjust water as needed in between. Switch off flame and store in a bottle. To prepare aam chutney dahi puri: Sweeten the curd with sugar and milk. Mix to make it smooth.Gather all the ingredients needed. In a serving plate, arrange puris. break open the top. Fill with boiled cubed potato and cooked green moong.Add the sweet mango chutney, green chutney and sweet dahi (curd).Top with sev, chopped coriander leaves. To prepare Mango sweet chutney:Scoop the pulp of mango. Grind it smoothly (total 1 cup) In a heavy bottomed saucepan, take mango pulp, black salt, amchoor powder, red chilli powder, roasted cumin seeds powder, dry ginger powder, powdered jaggery and mix 1 cup water. Heat over flame. Boil for 2-3 minutes or until the sauce turns shiny side. Adjust water as needed in between. Switch off flame and store in a bottle. To prepare aam chutney dahi puri:Sweeten the curd with sugar and milk. Mix to make it smooth. Gather all the ingredients needed. In a serving plate, arrange puris. break open the top. Fill with boiled cubed potato and cooked green moong. Add the sweet mango chutney, green chutney and sweet dahi (curd). Top with sev, chopped coriander leaves. Serve immediately. If you like, sprinkle more red chilli powder and chaat masala while serving.